We’re still a far way’s off from being able to beam people through space, but in a science first, physicists have successfully transported information across a solid state system similar to a computer chip. The breakthrough could lead to more powerful processors and highly sophisticated encryption schemes. 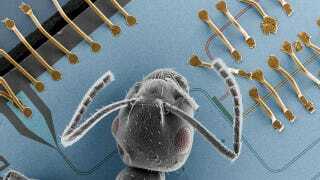 Top image: An ant placed atop the superconducting circuit to illustrate the relative proportions of the macroscopic electrical circuits (Photo: Jonas Mlynek / ETH Zurich). To properly comprehend this achievement, we’ll have to temporarily set aside our notions of (intuitive) classical computing. Unlike classical computing, in which a bit has two possible states (1 or 0), quantum computing utilizes quantum bits (or qubits) which carry two values simultaneously. This is referred to a state of entanglement, where the state of two bits cannot be separated (i.e. they can be assigned both a 1 and a 0 at the same time, a so-called “shared correlation”). Subsequently, qubits can only be described by how they relate to each other — a kind of “magic” link between two locations or parties. Moreover, the properties of two particles can be tied together even when they’re far apart (this is why quantum physicists call it “spooky action at a distance”). By exploiting this effect, Andreas Wallraff, a professor at the Department of Physics at ETH Zurich, successfully transported information from two distinct spots on an electronic circuit. Specifically, his team moved data a distance of six millimeters from one corner of a chip to the opposite side. Indeed, unlike scifi transporters, where matter is moved from one location to another without traveling, quantum teleportation involves the disappearance and reappearance of information. Wallraff and his team achieved this by establishing a state of entanglement between the sender and the receiver — in this case points A and B on an electronic circuit. These two locations were physically separated from each other, but they held on to their shared entangled state. The physicists then programmed quantum information into their device at the sender. And because the two parties were entangled, the information could be read at the receiver. Put another way, the information did not travel from point A to point B. Rather, it appeared at point B and disappeared at point A at the exact moment it was read out at point B. This isn’t the first time that quantum teleportation has been observed. Nor is the distance anything to get excited about (as an example, Austrian scientists successfully managed to teleport information over a hundred kilometers using optical systems). But prior to Wallraff’s experiment, no one had managed to do so in a system made up of superconducting electronic circuits — circuits that could find their way into future quantum computers. Theoretically, these systems could be wickedly fast, teleporting 10,000 quantum bits per second. It could also result in larger-scale encryption technologies and better error correction schemes. More futuristically, it may eventually be possible to teleport information from one location to another in a future quantum device or processor. And in fact, the researchers will eventually try to teleport information from one chip to another.